It is required to validate the HPLC methods used for analysis of pharmaceutical products. It is a regulatory requirement to verify all analytical methods. In the pharmaceutical industry, validation is an essential part of quality control and quality assurance. Various regulatory authorities give particular emphasis on the validation of all the processes used in the industry. Validation is a formal and systematic way to demonstrate the suitability of the assay method to provide useful data to ensure that the process or the technique gives satisfactory and consistent results within the scope of the process. The analytical techniques refer to the way of performing the analysis. Validation is the procedure by which it is set up, by research facility considers, that the execution qualities of the strategy meet the prerequisites for the proposed application. All the investigative procedures that are planned for examining any specimen should be approved. The present high assembling rehearses recommend that quality ought to be incorporated into the item, and testing alone can't be depended on to guarantee item quality pharmaceutical products need to maintain high quality to provide safe and effective usage. From the analytical point of view, analytical methods used to test these products should have quality attributes built into them. 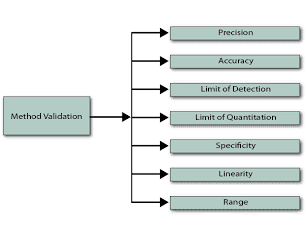 Validation ensures these quality attributes are built into the method. Validation of analytical methods is an essential but time-consuming activity for most analytical laboratories. But it results inexpensive, eliminates frustrating repetitions and leads to better time management in the end. The analytical methods need to be validated or revalidated before initial use of the process in the routine analysis when transferred from one laboratory to another, at whatever point the conditions or strategy parameters for which the technique has been approved change and change is outside the first extent of the training. Chromatography is characterized as a method by which solutes are separated by powerful differential relocation process in a structure comprising of at least two versatile stages, one of which moves consistently in a provided supervision and in which the individual substances display diverse mobilities by reason of contrasts in ingestion, segment, solvency, vapor weight, atomic size or ionic.charge thickness. When mobile phase used is liquid the type of chromatography is called liquid chromatography. High performance liquid chromatography (HPLC) is a modern form of liquid chromatography that uses small particle cylinders through which the mobile phase is elevated at high pressure. The separation of components depends on the extent of interaction between the solute component and the stationary phase. The part that has the lowest affinity for the stationary phase will elute first. HPLC is becoming a preferred method of analysis among various analytical methods for pharmaceuticals. HPLC methods provide rapid analysis, higher sensitivity, high resolution, easy sample recovery, precise and reproducible results. Validation Protocol: Validation protocol prepared is a document that indicates the company’s approach to validation. It ensures consistent and efficient execution of validation projects and also answers auditor during audits. Revalidation: Revalidation is necessary whenever a method is changed, and the new parameter is outside the operating range. The operating parameters need to be specified with ranges defined. In case of methods for quantitation of impurities, if a new contaminant is found that makes the technique deficient in its specificity, it needs modification and revalidation. Identification tests: To ensure the identity of an analyte. The quantitative analysis for impurities: to accurately and quantitatively reflect the purity of a sample. Limit test for impurities: to reflect purity characteristics of the sample. Assay of drug substance and drug products: to measure accurately and quantitatively the analyte present in the sample. These methods also include analysis of content uniformity and measurement of the analyte from dissolution sample. Selectivity and Specificity: Selectivity of the logical strategy is characterized as how much a procedure can measure the analyte within sight of interferent's different segments which might be available incorporate pollutions, degradants, grid, and so on. Linearity: Linearity of a technique is its capacity to acquire test comes about that is accurate relative to the example fixation over a given range. Precision: The precision of a systematic strategy communicates the closeness of assertions between a progression of estimations got from various inspecting of the same homogeneous specimen under the endorsed conditions. Exactness might be considered at three levels: repeatability, accuracy, and reproducibility. Repeatability is the exactness under the same working conditions over a short interim of time. It is also termed as intra-assay precision. It is assessed by making six sample determinations at 100% concentration or by preparing three samples at three concentrations in triplicates covering the specified range for the procedure. Range: The range of an investigative strategy is the interim between the upper and lower centralization of an analyte in the specimen (counting these focuses) for which it has been shown that the systematic methodology has an appropriate level of exactness, precision, and linearity. The range is ordinarily gotten from the linearity ponders and relies upon the expected use of the strategy. Accuracy: The precision of a systematic technique communicates the closeness of assertion between the esteem acknowledged either as an ordinary genuine esteem or an admitted reference esteem and the respect found. No estimation procedure is perfect, along these lines, the authentic or real appreciation can't be precisely known in a specific estimation. The acknowledged good incentive for exactness evaluation can be surveyed by investigating an example with public focus. The exactness considers generally completed by deciding the recuperation of the spiked specimen of analyte into the lattice of the sample (a fake treatment) or by contrasting the outcome with the consequences of an individual reference material of known immaculateness. On the off chance that the phony treatment of the specimen isn't accessible, the strategy of standard expansion is utilized. If there should be an occurrence of techniques for quantitation of polluting influences, the example with the known measure of debasements is evaluated. Limit of Detection: The utmost of location of an individual logical methodology is the most minimal measure of analyte in the specimen which can be identified yet not evaluated as a correct esteem. As far as possible can be resolved in various ways. The least complex approach depends on the flag to clamor proportion. The flag to commotion proportion is dictated by contrasting measured signs from tests and the known low convergence of analyte with those of clear examples. Limit of Quantification: The quantification furthest reaches of an individual scientific method is the most reduced measure of analyte in the specimen which can be quantitatively decided with appropriate exactness and precision. It is fundamentally influenced by the finder affectability and accuracy of test arrangement. As far as possible can be resolved comparably as that of as low as possible. Very needful information. Can you forward the same to me. mail id " sathishgavireddy@gmail.com "